There are some spots where time has stood still. 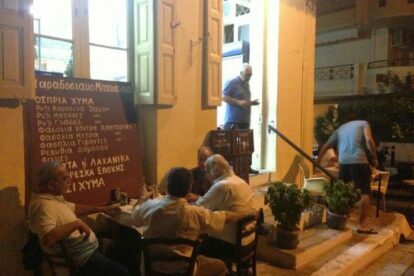 One of them is Philippa’s grocery store (To Bakaliko tou Filippa, Το μπακάλικο του Φίλιππα in Greek), which has basically stayed the same since 1912 when it first opened in Piraeus, Athens. Back then, it was common for grocery stores to have some tables for the customers and offer wine and something like finger food or small portions of food (meze). At the same time they sold fruit, vegetables, legumes, cheese etc, all carefully selected and of great quality from different parts of Greece. The store still works somewhat like that with its current owner, Philippas, a kind man who serves the tables with an everlasting smile on his face. It’s as if something from that time stuck with him. Philippa’s meze is simple in concept, yet delicious in taste and the prices are really good too. Add to all this the regular customers (of which there’s quite a few) and there is no way you’ll get out of there without having somebody talking to you and telling you their stories. And to top it up, place all this scenery in a building overflowing with history and a little doorway leading to the back parlor and the hidden yard. Personally, when I leave the store, I usually shop kefalograviera cheese, the same one that’s served in the store. I think it’s a nice way to get a tasty “souvenir” from there and have a reason to return when it’s over!